Such is the title of a chapter from Pope John Paul II’s landmark 1998 encyclical, Fides et Ratio, on the relation between faith and reason, theology and philosophy. 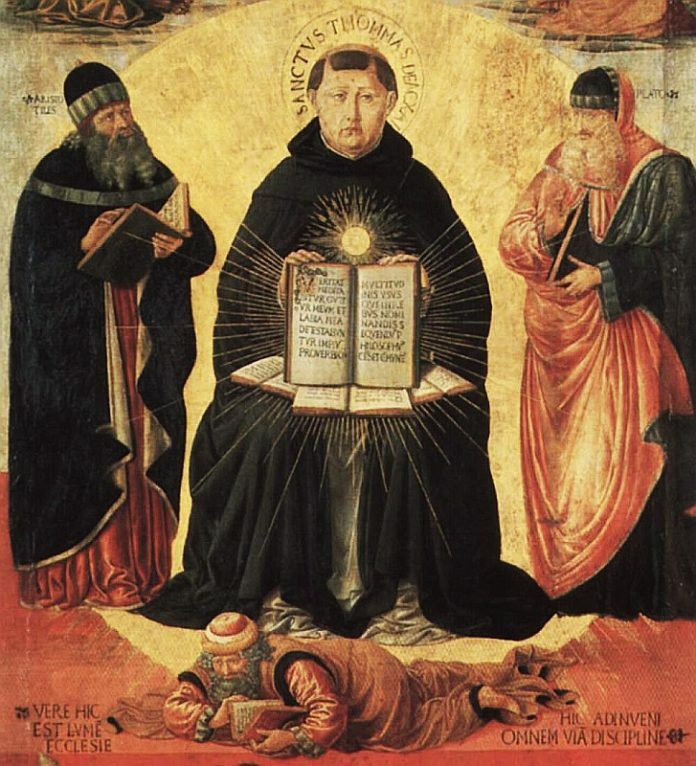 We may ask, why Saint Thomas Aquinas, whose dense works in Latin are now eight centuries old? The question is a legitimate one, for there have been countless theologians and philosophers in the Church’s two millennia, yet the 13th century Dominican friar Thomas D’Aquino is the one most recommended, most celebrated, the one who really consolidated the intellectual patrimony of the Church, bringing together faith and reason – like Odysseus bending the bow, to use Josef Pieper’s vivid analogy – into a harmony, by which the human intellect ascends to the height of truth. Thomas’ whole life – from the age of five, when he was offered as an oblate to the nearby monastery of Monte Cassino – was wholly dedicated to truth, and the Truth. No compromising or dilly-dallying, no wandering off, just prayer, work, teaching and writing. In his later teenage years, fortunately bereft of that four years of malformation we now know sadly as ‘high school’, he joined the recently-founded, and for its time radical, Dominicans, the Order of Preachers, whose main charism was study and preaching. Before his untimely death in his fiftieth year – well, God knows the day and hour of each of us – Thomas produced a prodigious corpus of theological and philosophical writings that are nearly miraculous, often keeping three scribes scribbling at once, which provide the basis of thought for all future students. That is why the thought and methodology of Saint Thomas – what we generally mean by ‘Thomism’ – have been proclaimed and prescribed by the Church in the highest and most authoritative of terms. He is put forward as the ‘master’ of studies in the documents on education and on the formation of priests in the Second Vatican Council, and is also as the primary teacher of theological studies in the 1983 Code of Canon Law. In both the Council and the Code, Thomas is the only person spoken of by name besides Christ and Our Lady. Saint Thomas was impartial in his love of truth. He sought truth wherever it might be found and gave consummate demonstration of its universality. In him, the Church’s Magisterium has seen and recognized the passion for truth; and, precisely because it stays consistently within the horizon of universal, objective and transcendent truth, his thought scales “heights unthinkable to human intelligence”. Yet there are so many Catholics who have scarcely heard of Saint Thomas, to say nothing of having read him. All too often, their approach to truth is emotionalist, subjectivist, mushy and ill-formed. On the other hand, to continue with Pieper, he two hallmarks of Saint Thomas, are precision and clarity, the truth nearly distilled to its essence. There are no ways comparable to forming the human intellect than a careful reading of Thomas, especially his magnum opus, the Summa Theologica. If it has been necessary from time to time to intervene on this question, to reiterate the value of the Angelic Doctor’s insights and insist on the study of his thought, this has been because the Magisterium’s directives have not always been followed with the readiness one would wish. In the years after the Second Vatican Council, many Catholic faculties were in some ways impoverished by a diminished sense of the importance of the study not just of Scholastic philosophy but more generally of the study of philosophy itself. I cannot fail to note with surprise and displeasure that this lack of interest in the study of philosophy is shared by not a few theologians. So follow the great advice of the great Pope, and all of the Church’s Magisterium: Delve a little into the mind of the great Thomas, and say a prayer for all those trying to get the truth across to a world so immersed in falsity. We could use a lot more of his precision and clarity to cut through the fog around us.